Sometimes, going to the dentist can seem like a daunting task, especially when you have multiple problems going on in your mouth. It is stressful worrying about what you need to do for your dental care. Some people have this mindset that since it’s just teeth, it’s not really impacting your overall health. In fact, your oral health can have an impact on your overall health. Talking with a dentist about a full mouth restoration is an excellent way to tackle your dental health issues and be on your way to a beautiful smile. This procedure is an efficient way for your oral hygiene to get back on track. A full mouth restoration is when a patient has several problems with their mouth, and a dentist performs reconstructive procedures. 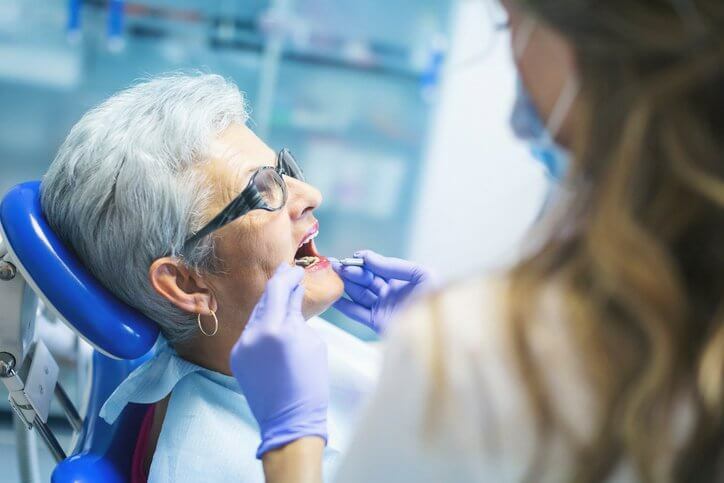 Patients that typically qualify for a full mouth restoration is a patient that has oral health issues with their teeth and the supporting tissues in their mouth. These supporting tissues include the gums, tongue, lips, and inner cheeks. In addition, the patient needs to be healthy enough to go under local or general anesthesia. This anesthesia option will often require the patient to go over their complete medical history with the dentist during the initial consultation. This information will help to identify the best candidates and any potential risks. It can also play a role in treatment plans. For instance, a senior may end up with a treatment plan featuring less invasive procedures than for a younger patient. An example of this would be with mini dental implants versus a more traditional dental implant. You may have heard of a full mouth makeover, but that is different from a restoration. In a full mouth makeover, cosmetic procedures create a more stunning smile. A full mouth restoration is distinct in that while it can address aesthetic issues with your mouth, it also treats diseases, damage, and dental problems. It goes beneath the surface. Why Might One Need It? Full mouth restoration is a procedure that is necessary for someone that’s ready to get the full function of their mouth back in one procedure. It’s possible to go through numerous procedures to address each of the problems individually, but that takes a great deal of time. This option allows the person to fast-track this treatment. What Are Some Various Procedures Associated With Full Mouth Restoration? There are a number of dental procedures that can be part of a full mouth restoration. These methods are put together into a specific treatment plan for that patient to fit their actual needs. This process includes restorative dental treatments, such as bridges and crowns. Implant dentistry where dental implants are used to replace teeth that are missing is another procedure that can be part of this process. Cosmetic dentistry, such as veneers, dental bonding, and even gum recontouring is included for some patients. Neuromuscular dentistry which is treating bite problems and issues with the temporomandibular joints as this can have a significant impact on patients. Treatments for bruxism, which is a therapy for patients that grind their teeth can be included. Orthodontics, such as braces or retainers is another potential treatment option. Oral surgery, such as extracting bad teeth before implants or root canals are additional treatments. Finally, periodontal therapies including periodontal surgery, scaling and root planing may be added to a full mouth restoration. The reason for such a wide variety of procedures is that this process is not a one size fits all situation. A dentist needs to tailor make a treatment plan for their patients to get the full benefit, and this leeway can help you address your most important issues. What Are Some Benefits of a Full Mouth Restoration? There are a number of benefits that come from a full mouth restoration. The first is that the procedure will address all of the problems with your oral health. No more pain. You won’t fear that your smile will be too wide and show off your problematic teeth. No more embarrassment over your oral health. Another benefit is that you won’t be scheduling appointment after appointment. Sedation dentistry is often a route to take for a full mouth restoration to make it easier on the patient. That is due to sedation allowing for more than one procedure at a time. You’ll also benefit from not having time to back out after the first procedure. Often, the reason why a person avoids the dentist is that they have a phobia or dental anxiety. This anxiety can lead to cancellations. A full mouth restoration doesn’t give you a chance for cold feet. Do have several dental conditions that make you believe that you’re a good candidate for full mouth restoration? Contact McCauley Dental today to learn more about this procedure, and to set up an appointment to get started on your path to better dental care. You deserve the opportunity for a healthy smile.